Griffin iTalk [Voice Recorder for iPod] - iTalk converts your regulary play/pause buttons on the iPod into voice recording buttongs. First, connect your iTalk to the top of your iPod and its recording functions will automatically appear on the screen. Your iPod will automatically switch to Voice Memo mode,ready to record. Press the Play button on the iPod to begin recording. The iTalk's red LED will light up to indicate it's recording and a 'Recording' prompt will pulse on the screen of the iPod. XtremeMac MicroMemo [Digital Audio Recorder for iPod] - This latest iPod recording device has a detachable, omnidirectional microphone and a built-in speaker for instant playback without headphones. When attached to the iPod, MicroMemo activates the iPod's menus and displays recording time on-screen. MicroMemo attaches to the iPod via the Dock connector and records 16-bit audio in high-or low-quality formats. The microphone is detachable from its 3.5 mm port, which can toggle between microphone or line-in settings for use with stereo microphones or other audio devices. Catapult captures video content from DV Camcorders or HD Video camera and stores them directly in the iPod's hard drive or any other USB Drive. Think of Catapult as a device that converts your MiniDV or DVD Camcorder into a Hard Disk Video camera like the JVC Everio. You capture video footage with the regular camcorder but store it directly on the hard drive and not on the tape. Catapult supports remote trigger recording and time lapse features to record frames of video at specific intervals. It works with DV and HDV format cameras that include a FireWire connection, such as those from Sony, Canon, JVC, and Panasonic. iSee 360i video recorder - Unlike the iPod with video, which simply plays video content, the iSee 360i also allows users to record content from TV, VCR, TiVO or any other analog video source like the Hi8 format Sony Handycam. 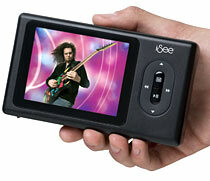 The iPod slides into place inside the back of the iSee video device. Now connect the iSee device to the video source and record. It records in MPEG-1, 2, 4, AVI, Windows Media or QuickTime. Quick Tip: iPod mini firmware does not support voice recorder.